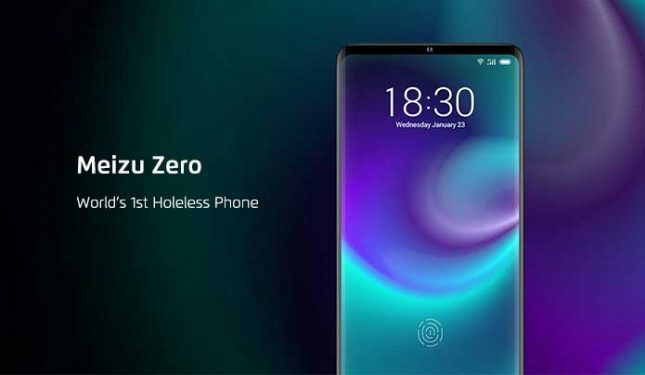 Smartphone maker Meizu is doing something a bit different with its coming smartphone called the Zero. Rather than fighting leaks on the build-up to launch, the company has put the device up on Indiegogo to sell units before production starts. The big claim to fame for the smartphone is that it is the world’s first holeless smartphone. That means no notch, no pinhole for the camera, and no openings for the mic or speaker, no openings at all. The phone has a ceramic unibody design and uses a curved OLED display. There are no physical buttons on the side of the phone to maintain the minimalist aesthetic. Instead, the device uses pressure sensing tech to create virtual side buttons. The lack of holes on the phone means an improved water resistance rating. Wireless charging is supported along with wireless high-speed USB connectivity. With no charge port, the device can only be charged via a wireless charger. Wireless USB tech inside uses 60GHz to handle the same bandwidth rates as normal USB 3.0 connectivity. The entire front of the device is a speaker thanks to mSound 2.0 in-screen sound tech. The campaign is seeking $100,000 and has raised over $25,000 as of writing with 30-days to go. You can get an “Exclusive Engineer unit” for $1,299 with delivery aiming at April 2019. One person claimed the Exclusive Pioneering Unit that was delivered this month for $2,999.